I’m saddened to report that with the introduction of the new Cinque Terre Express light rail (and the increased ticket prices that came with it), TrenItalia has done away with the weekly pass for the Cinque Terre trains*. For those than plan to visit the Cinque Terre for just one or two days, the all-inclusive Cinque Terre Card is probably the best option. For more information on the Cinque Terre Card and all that it entails, click here. Are you planning to stay in the Cinque Terre for three or more days? The monthly train pass which I’ve detailed here is worth considering. While this isn’t as inexpensive as the weekly pass once was, it can still be advantageous for those planning to use the trains frequently during their stay. *While not available to visitors, the weekly pass is still available for residents of the Cinque Terre, Levanto and La Spezia (but proof of residency is required). Even if you are purchasing the abbonamento settimanale in another village (Manarola, Vernazza or Corniglia) or even city (La Spezia or Levanto) you’ll still want to specify that the ticket will need to be for Monterosso to Riomaggiore (as those are the northernmost and southernmost villages of the Cinque Terre, that way you can travel back and forth between all five villages as much as you’d like). I am so happy to hear that, Ted! In case you happen to still be in our area on Monday, Corniglia has its patron saint festivities (for St. Peter) that evening. It’s most definitely worth seeing! Hi Amy, We are arriving in La Spezia by train from Milan and leaving from La Spezia to Rome. We are staying in Vernazza. Would La Spezia be included in this pass or would we need to buy a seperate ticket from La Spezia to Vernazza and vice versa? Thanks for your informative blog. The weekly passes are priced based on the number of kilometers they cover. If you’d like to include La Spezia on the pass you’ll need to specify that when you make your purchase (be sure to specify that you’d like the “abbonamento settimanale” from La Spezia Centrale to Monterosso) as it will cost a little more. I just checked and the weekly pass for unlimted trains between La Spezia Centrale and Monterosso would be €14.30 (as opposed to the Riomaggiore to Monterosso weekly pass which is €10.60). Considering that a one-way ticket from La Spezia Centrale to Vernazza (or vice-versa) is €2.40, it’s definitely worth your while since you’ll be making that trip twice! Hope that helps and thanks for reading my blog! Thankyou Amy, you have been most helpful. Only one week to go! I´m going to Cinque Terre in May and I´m really looking forward to it. We will have our base in Levanto (because we had problems finding hotels in CT). Will the week pass described above be valid also from Levanto to CT? Grazie mille! And thanks for reading my blog! You can purchase a weekly pass for the regional trains beween Levanto and Riomaggiore for €12.50 and this will give you unlimited train travel between where you’re staying (Levanto) and the Cinque Terre villages (just be sure to ask for the “abbonamento settimanale da Levanto a Riomaggiore per i treni regionali” when you purchase it). Don’t forget that the pass is valid from Monday-Sunday. 🙂 I hope you have a lovely time on your Cinque Terre holiday! And thank you for your answere! So for €12.50 we can travel as much as we want between Levanto and Riomaggiore!? That´s a great deal. We will arrive to Levanto on Sunday afternoon so a travel pass from Monday morning will be perfect. When I have a CT expert here, can I ask you two other questions? First, if I understand it right, for some of the hiking trails we need to pay a fee. Do we have to buy some kind of day pass, or can we buy when we enter the trail? What do you recommend us to do? We will stay for four nights. Second, is there any nice winerys in the surrounding area that you can recommend? Grazie mille for your time and answer! Than we skip the Cinque Terre Card and focus on the weekly train pass and pay for the trail when we meet someone 🙂 I´m trying to keep me up to date about the status of the trails but there is so much different information on the Internet. I don´t know who to trust… But for sure, I will keep an eye on your blog before arrival. Oh, I´m looking forward for the trip so much! Very, very helpful! Thank you, Amy! I really appreciate your blog and updates about the CT region. We are so looking forward to our stay next month! Grazie mille, Rachel! It makes my day to read feedback from people reading my blog. 🙂 I’m happy to be of help! Hi Amy, great information. Thank you so much. We will definitely follow your sound advice which is greatly appreciated. Thanks for some great information Amy! My Fiance and I are heading to Vernazza late September. I have researched and read that we would need a special CHIP and PIN credit card to use the ticket KIOSK…is this true? I have a CHIP card but not the chip and pin…U.S. is a little behind…Let me know what you think. Thanks and I appreciate all your blogs!!! Thanks for following my blog! I’m not certain about the chip/pin situation in the computer kiosks so I will research that for you and get back to you. 🙂 If you’re worried, you can always purchase your tickets in advance at http://www.trenitalia.it (that’s the *official* TrenItalia website, not to be confused with the gazillion other website that sell train tickets in Italy at a premium rate). Your blog is great and so useful 😀. The information about the weekly train pass is great but can you suggest the best option for us, we will be travelling by train on a Sunday in Septemer from Genoa and staying at Riomaggiore for two nights and then Monterosso for two before returning to Genoa to get a flight. What would you suggest the best train ticket options would be. Also is there anything that combines the ferry fares and train fares? Once upon a time there was a ticket that combined the ferries and the trains but they stopped selling those quite a few years ago. Actually, that’s a good thing because people were out of money if per chance the sea or weather conditions were poor and the ferries stopped running. It sounds like you will have three full days (Monday, Tuesday & Wednesday) in Cinque Terre, correct? If you plan to take more than five trains between the villages in those three full days the weekly pass (abbonamento settimanale) will have already paid for itself. You wouldn’t want to purchase that pass until Monday, however (as if you buy it on Sunday it would be good only for the remainder of that day as the passes are good from Monday-Sunday). Aside from the economic advantages of the weekly pass, there’s also the convenience factor to consider (as you will be able to hop on and off the trains without hassle). Just don’t forget to write your first and last name on the pass (and have ID with you that matches that name) and to validate before boarding your first train (after that you’re good to go!). Great Help here really!! we plan to be in 5 Terre 16-19 july (Thursday to Sunday) and this tips will really handy. Yesterday i just desperate how to park my car and what pass should i and my family will buy in 5Terre. But now every things become clear after reading your articles here. about the price , is there any discount for 6years old kids , and 65 years senior? we are going to bring our mother and our two children 6 and 1.5 years to 5 Terre. From the bottom of my heart I say THANK YOU! with a big smile! As you’re traveling with children, I definitely recommend reading through my post on traveling with kids in the Cinque Terre (click here). At the bottom of that post I talk about discounted rates for children (including on the trains). Regional train tickets should be half price for children ages 4-11. To my knowledge, there’s no reduced rate for seniors (I browsed the official TrenItalia website and didn’t see anything mentioned). Hi Amy, My husband and I will be staying in Corniglia and using the shuttle bus to and from the train station, will the weekly train pass cover the shuttle bus transport as well? Thanks for reading! Unfortunately, the train pass is *only* for the trains so it won’t include the buses that you’ll find in the villages. On the other hand, if you purchase the Cinque Terre Card it would include the buses, trains and walking paths along the coastal trail. Do you know what are the La Spezia train station ticket counter operation hours? We need to be at Corniglia by 5:30 pm on a Monday and do not have much time to spend at La Spezia station. If we missed the opening hours we are afraid buying the weeklong pass at the ticket machine will take a long time. Can we buy the weeklong pass at the tobacco store? Please pardon the delayed reply, I’ve been tending to sick kiddos. The hours for the La Spezia Centrale ticket office (according to the official website) are from 6am to 8:35pm, 7 days per week (including holidays). You will need to buy the weeklong pass either there or at the self-service kiosk (to my knowledge they don’t sell them at the tobacco shop). HOWEVER, keep in mind they are intending to raise rates for the Cinque Terre trains on May 8th of this year. I haven’t posted about it yet here on the blog because in grand Italian fashion nobody *really* knows the details and the date for the price increase has already been pushed back twice (and very likely will be again). There’s currently a civil suit being taken to the court of appeals by Cinque Terre residents and businesses opposed to the price hike and new train schedule. So yeah, welcome to Italy! If, and that’s a big IF, the price increase takes place they may no longer offer the weekly pass. At this point we just don’t know. Can you tell me the extents of the weekly train pass. For example can you get it for travel from Riomaggiore to Santa Margherita Ligure and all points in between? The pass that I mention here on the blog is best for those traveling amongst the Cinque Terre villages and quite possibly La Spezia or Levanto (which is slightly more expensive as it’s more kilometers of travel). If you are planning to travel to as far as Santa Margherita Ligure I think point-to-point tickets will be your best option. Great article about the train tickets for the Cinque Terre villages and comments/posts. We were there on the 15th April, so only about two weeks ago and had an interesting experience. Without wanting to bore you it requires some detail. We drove from Santa Margharita to Monterosso for the village visit train trip, parked in the Public area by the sea for 2 euro per hour. Walked the 100m to the train ticket office, said we didn’t speak i=Italian and explained to the lady that we wanted to visit all the villages and hop on & off the trains when we were ready. She said she understood what we wanted and issued us with two tickets at 1.8 euro each. We validated them and off we went looking forward to seeing these villages we’d heard so much about and seen so many images about on the net. We finally got to Riomaggiore and at the train station found that my wife had lost her ticket. So bought another for the return trip to Monterosso, 2 minutes from Monterosso a chap in uniform came by checking tickets. Without any reservation we presented ours for inspection, he started waving his index finger from side to side and started muttering in Italian to all those listening that we had a problem. He said that many, many tourists tried to get away with this trick and take advantage of their service, to which I naturally took offence and told him of the process I went through to get the correct tickets to avoid this type of drama. He ignored any reasoning and said he would be issuing a fine of 52.1 euros each. I kicked off and told him his fortune, he then said he would only fine me as my wife had a passable ticket. I was still really angry, but knew I would get nowhere with this little uniformed garden gnome. So paid the 52.1 euros in cash and got a receipt plus a photo of his ID. also about ways for them to make the service more productive if they have the reported 2 to 2.5 million visitors a year. They could benefit from a few simple signs or indicators for the many, many tourists that make our mistake how much Euro they must be missing out on to improve their service. Anyway it did leave a very bitter taste and we are interested in your view as to us having any chance of getting this fine refunded. I’m so sorry to hear of your train mishap! To be honest, the controller was right. There is no “hop on/hop off” ticket for €1.80 per person. That would be an amazing deal! What the woman sold you was a one-way ticket from Monterosso to Vernazza, so obviously there was some sort of misunderstanding (I’m assuming due to the language barrier?). Had you wanted an unlimited day pass for the trains you would have had to a) buy the Cinque Terre Card for €12 per person (this would include unlimited trains plus hiking along the coastal trail), or b) purchase the weekly train pass (even if you planned to use it for just one day) for €10.60 per person. There’s no need for a hiking pass *unless* you want to hike the coastal trail (which is €7.50 per day). You can hike both portions that are open in the same day if you’d like (allot circa 3 1/2 hours). All other trails in the park are free of charge! We tried to find the weekly pass from the machine but were only able to buy a monthly pass or something that appeared to be a 5 day resident pass, has something changed? Your information has been so helpful! Thanks for reading! I’m sorry to report that they’ve just increased rates and they’ve done away with the weekly pass for everyone except residents. 😦 At this point, if you plan to take more than four trains in one day you should buy the Cinque Terre Card (€16 per day). Reblogged this on Cinque Terre Insider. December is a quiet month to visit. If you are wanting to witness the Cinque Terre as it once was, you’ll love it. Just keep in mind that quite a few places will be closed as it’s the off-season (unless you visit between Christmas & New Year’s Eve). Thanks for your very interesting articles. I hope you can give me some advice because it’s difficult to find the right information on the Internet. I get a lot of contradictory information. In august we want to visit Cinque Terre with a group of 33 persons (young people in the age of 16-23) for one day. I have read that you can buy a ticket at the station of La Spezia for one day which will give you access to some buildings and hiking routes and the busses in the park. More important is that we can travel by train from La Spezia to all the villages in Cinque Terre. Because of the contradictory information I want to verify this informative and I hope that you can help me with that. Do you recommend such an card for us or can we better buy another card and if yes, which one? Do you have some other recommendations or suggestions? Thank you for your advice in advance. You’ll want to buy the Cinque Terre Card which is currently €16 per, person, per day. That card will provide you with unlimited train rides between the villages (and as far as Levanto & La Spezia), the possibility to hike along the coastal trail, the use of the buses in the villages and a few other little perks. Keep in mind that having such a large group will not be easy in the Cinque Terre, especially getting 33 of you on the same train successfully. My recommendation is to break your large group up into smaller groups which will be much more manageable in the Cinque Terre. Thank you so much for your information. It’s helpfull for us! Can we buy at the station of Levanto the Cinque Terre Card? If that’s te case, we won’t have to travel to La Spezia and can we save on our costs for public transport. Which villages do you recommend most? I think we won’t have the time to visit/see everything. Yes, you can most definitely purchase the Cinque Terre Cards at the Levanto train station (you’ll see a national park TI office there, which is where you can buy these passes). If time is limited I would visit Riomaggiore or Manarola (they are quite similar), Vernazza and Monterosso. Salve Amy e grazie per questo website! We are thinking of visiting Italy again this summer and staying in the Cinque Terre area for 2 or 3 nights. We will probably stay in La Spezia as the prices in the villages are just too expensive for us and we don’t mind “slumming it” in a town rather than a beautiful location overnight. I just wanted your opinion on whether that is a good idea, if you would recommend getting a train pass for 2 days while we are there and if you have any recommendations for the best way to see this great area in a short time scale by train (or boat)? Our mobility isn’t great so we won’t be hiking or even walking too far if possible. Thanks in advance for any advice you can give! If you stay in La Spezia my recommendation is to not stay too close to the train station and to avoid booking a place in or near Piazza Brin. Those areas, while okay during the day, can be dodgy at night. There are lots of accommodation offerings on via Prione and the little lanes near it (“affittacamere” or room rentals will likely be less expensive than hotels, I recommend checking on AirBnB). Via Prione is a historic pedestrian-only street in the shopping district, just a short walk from the train station. You would have shops, cafés & restaurants all on your doorstep. Traveling by ferry is much more pleasurable & scenic than by train. They offer a day pass which allows you to hop on and off as you please. You could even pick the ferry up directly in La Spezia and travel to Portovenere (beautiful!) where you’d catch a different boat for the Cinque Terre. If you have mobility issues you’ll probably not want to disembark in Riomaggiore as there are steep stairs and inclines from the docking point to the village but Manarola, Vernazza & Monterosso should be just fine. If you prefer to use just the trains, it could be worthwhile to buy the Cinque Terre Card that is good for two days (and costs €29). Otherwise, individual tickets will cost €4 and you’ll need a new one for each train you catch (do the math to see which makes more sense with your planned itinerary). We are coming back to Riomaggiore in June. I’ve just done a dummy run on Trenitalia to buy a weekly ticket and there are no residency restrictions. Is this just because it is out of season at the moment or have they changed the rules again? No, things have not changed… for the weekly pass (which you *can* purchase online) you’ll have to show proof of residency when the controller comes to check tickets. The monthly pass (circa €30) is good for both residents AND visitors, so if you’re staying for more than just a few days it could be a good option! Thank you. Thats a shame. Last year we bought the monthly ticket and will probably do the same this year. Its worth it just to avoid the queue in the ticket office! We have accommodation in La Spezia about 5 minutes walk from Stazione Centrale. I saw your comment regarding the train station at night. Is it safe to walk there, since we will come back in the evening from 5Terre. As I know you are traveling with a young child, I doubt you’ll be staying out until the wee hours. In the late night hours there can be some unsavory characters at the La Spezia Centrale station and one should be wary. If you are heading back to your accommodations by 9 or 10pm it should be fine as there are still lots of people out & about. P.S. Might I ask what made you decide to stay in La Spezia versus one of the Cinque Terre villages? In my mind, there’s no comparison between staying in a nearby city and staying in the villages themselves. Unfortunately we could not find accommodation in 5T. And also I was afraid about parking possibilities in one of 5T villages. Anyway, we are used to traveling. I agree there is no comparison, but that’s it. We would like to visit also Porto Venere, and La Spezia is closer. 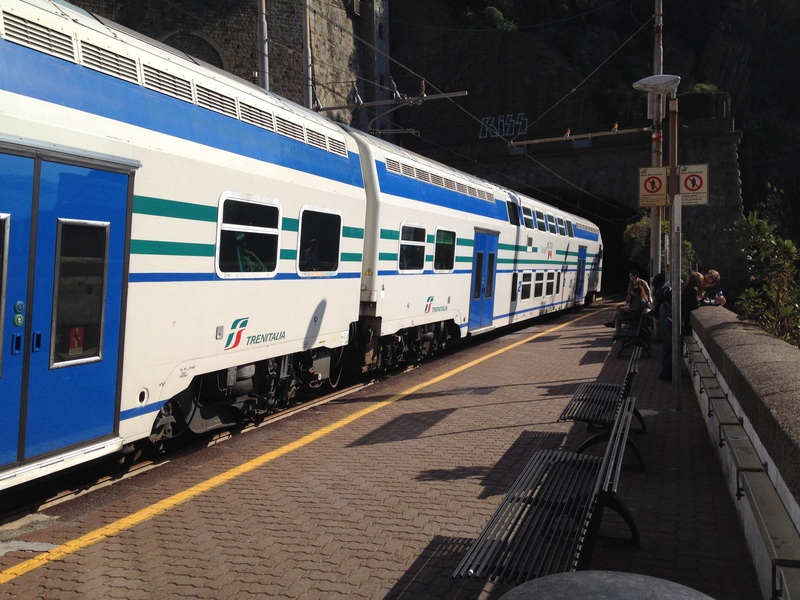 Each time you take a train in the Cinque Terre you’ll need to purchase a €4 ticket. Just for example, if you are in Vernazza and you want to go see Riomaggiore and then come back it would cost you €8 (as you’d take two trains). But let’s say on another day you want to take a train from Vernazza to Manarola, then a train from Manarola to Corniglia, and finally a train from Corniglia back to Vernazza. That would be three different trains so you’d need three €4 tickets (so the total cost would be €12 per adult). If you’d like to purchase the Cinque Terre Card (which includes unlimited trains between the villages and hiking on the coastal trail) you could purchase either the single day Cinque Terre Card (€16) or the 2-day (mind you, it’s two consecutive days) Cinque Terre Card (€29). Since you’ll be staying four nights in our area you could purchase any combination of those passes based on your plans (e.g. You could purchase two 2-day Cinque Terre Cards or one 2-day and one single day to cover three days, etc.). The ferries are completely separate from the Cinque Terre Card. If you plan to use just the ferry on one particular day then you wouldn’t need to have a Cinque Terre Card for that day. In general, I’d say weekdays are better for visiting Portovenere but since you are arriving on Tuesday and departing on Saturday any day would be fine (Wednesday, Thursday or Friday). I hope this helps clarify things for you. Thanks so much for the advice! Looking forward to our visit! Next Next post: Where to stay in the Cinque Terre? Take my quiz to find out!